The prediction from Weather Canada was that Winter would bleed into the first 2 weeks of March (even though the groundhog said it would be an early Spring) and then suddenly the temperatures would jump up. Well in my mind, Winter felt done at the beginning of March and it was just clinging on for dear life. There weren’t anymore snow falls, but the temperature was still below freezing for awhile before warming up. We moved the clocks ahead this month. Every time this happens, there are complaints and reports about how daylight savings time is bad and we should get rid of it. But for us, it works really well. Sun comes up right when the kids have to wake up for school, lasts through the entire day, and dusk is when they have to go to sleep. I went down to the Bay Area for a few days at the start of the month. I don’t end up going there as often as I should, but this time I had some time to catch up with a few friends. I also took an Air Canada 737 Max 8 down, and marveled at the new entertainment system Air Canada had on it. Of course, later in the month the 737 Max 8s were grounded across the world. This month was pretty light with weekends mostly free as kids were in-between extra-curricular activity terms. March break had them in camps so nothing out of the ordinary there either. November was the first month we spent in our new home and things are finally settling in. We still have a bunch of boxes to unpack but all the day-to-day things are sorted and organized. We also did a bunch of home improvement things (fixed stuff and bought some furniture here and there) but it’s safe to say that the Home Depot trips are dying down. We also dealt with a lot of garbage and recycling – each week there were 5+ bags waiting for the waste disposal people! We had the first snowfall of winter in the middle of the month – it was a pretty big one too (5-10 cm). That kind of freaked everyone out as they expected a heavy winter. But since then, we’ve only had a few dustings. Temperatures dropped below freezing in the middle of month too and haven’t really recovered. For work, I flew down to SF for the Samsung Developer Conference. I ended up doing part of a talk there. Nothing too exciting but one more thing to put on my LinkedIn profile. We didn’t go anywhere for Black Friday – it was too difficult to plan with our house up in the air, and we wanted to leave that long weekend available in case we had to take care of anything around the house. Turns out we didn’t so we just went around Canadian stores and bought various deals. Back when I was in public school, I always thought summers were pretty long! Then I went to University with their 4 month “summers” (sometimes Coop) and those were even longer. Well as an adult with kids in school, 2 months is definitely no longer long. I can’t believe we’re halfway through summer already. We started off July with a trip to Rochester to make good use of our membership at the Strong museum. Then it was off to camp for the kids. Each boy was in a different camp every week so that’s 8 camps in the month! I also ended up in Korea for a week for work. It was hot everywhere. Above 30°C in Korea, Rochester and Canada. We had a couple of cooler days in the month, but it has been a pretty hot summer around the world. We cooled off by going skating (skating camp for a week) and with our weekly lessons on Saturday. It’s strange and awkward to go from shorts to jackets. So far this year, we’ve used the “front yard of our house” (e.g., the street) much more than the backyard. The kids are at an age where they want to ride bikes and run around, which doesn’t work well in our backyard. Fortunately, the shadows from our block cover most of the street in the late afternoon and evenings, so even with the hot temperatures, they are able to run around there. April was a non-typical month in many ways. First, I spent half of it away from home on two trips. The first was a multiple-family trip to Orlando to visit Disney World. We had 3 families and 6 kids in total under 4 so there was a lot of running around and crying at various points of the trip. We were there for a little over a week and visited all 4 of the Disney theme parks. Immediately the day after I came back, I was on another plan to Korea for a work trip. This one was short, only 4 nights, but I still had to spend a lot of time on the plane doing the cross-Pacific travel. Luckily, I had some buffer room at the beginning of the month and at the end of the month to be at home and have some normalcy. The second reason that April was weird was that it was actually very cold. Unless it snows a lot in May, April will be the snowiest month this winter! The temperatures were under seasonal every day except the week that I was in Korea – there were even days, when we were in Orlando, where the high was below zero (thankfully, we were in +30°C…maybe that’s too hot though)! I continued playing Star Trek Timelines this month and have a nice crew of max level characters now. I’m actually running out of things to do every day in that game because in building up my crew, I have a big stash of unused equipment so future characters don’t require too much grinding (until they are high level). This month also saw the release of Hearthstone’s Whispers of The Old Gods expansion and standard format. I opened about 25 packs so far and only have 1 legendary (+ the free C’Thun). C’Thun decks are pretty fun at the moment, but that might be a novelty factor. This month, I didn’t have Canada Day long weekend because I was working on a US schedule. Instead, I had a four-day Independence Day long weekend, which I suppose is better, and we spent two of those days in Pennsylvania on a road trip. It was a good break because at that time, Toronto was going through a heat wave and our AC was “broken”. Also, at the same time, we didn’t have hot water. You would think those two things would cancel themselves out, but it didn’t. We ended up fixing both ourselves – the AC was “broken” because the Direct Energy guy that came in turned off our furnace to test things but never turned it back on (plus, he didn’t fix the hot water either – I don’t know why I pay these guys $37 a month). After a week reprieve, we were again without hot water or AC because a flash thunderstorm dumped an ocean on top of Toronto and took out the power for the evening. Other parts of the city had it much worse, being without power for a couple of days or having to swim out of a GO Train that was stuck in the Don Valley. The DVP completely flooded for the second time this year! Not sure whether this happened because the floods followed us from Calgary. I went to NYC for two days this month, and they were some of the hottest days in the summer. The forecast for my first day there was 40°C! I had never been anywhere that hot before – and I had a BBQ to attend. Luckily, I didn’t end up being barbequed, nor did it reach 40°C. I think it maxed out at 38°C. This month, we bought a lot of stuff. We planned our upcoming vacation and I bought a bunch of stuff in conventional stores and DealExtreme to plan for it. I bought a new computer and various other hardware. But all-in-all, July, the first month of summer, seemed to pass by relatively quick even though we didn’t spend a lot of time outdoors to do summer related activities. It’s February, typically the coldest month of the year. This year, it was actually cold and it was actually winter. We had the largest snow storm in Toronto within the last 5 years. I was lucky that it didn’t affect me much, and I still commuted to work without much difficulty. Then all the snow melted when we had a couple of above-0°C day, before another snow/slush storm hit us towards the end of the month. The groundhog predicted an early spring and I saw some squirrels running around and some sparrows flying (I guess they were fooled by those couple of warm days). I spent the last half of this month reading about and setting up my own corporation. I think if I have to do it again, it won’t take up a lot of time, but getting my head wrapped around the things I have to do, finding the best approach, and doing them took up time. There are a lot of little things to do, some in areas that I’m comfortable with (technical things and getting new accounts) and some in areas which I didn’t know too much about (accounting, banking). There’s a lot of things left to do so this work will extend into next month. I’m still playing Happy Street but I’m nearing the end. They released a Chinese New Year edition which kept me busy for awhile as I had to collect and craft the items necessary to unlock the special content – but now I’m almost at a stage where I’ve acquired all the premium content and nearing the level cap (at level 33 out of 35). I also have lots of supply of ingredients so the game is almost in maintenance mode for me – I just need to do a bit every day to collect premium currency. I guess I’ll have to wait for the next special update (Easter?) before deciding whether I should play it heavily. Last week in Toronto, I was watching CBC news and they said it hailed in Calgary. Not a big deal, it hailed in Toronto this year too! 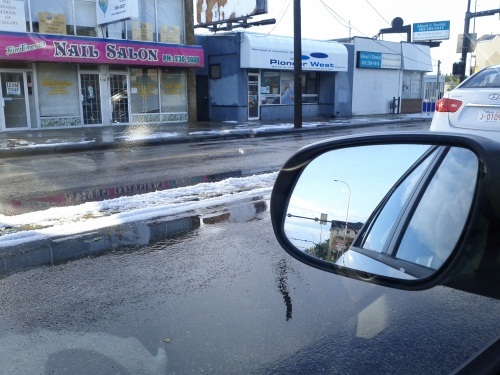 I was over in Calgary last weekend and just before I arrived, they said it hailed the day before I came too. I guess it is pretty common to hail in Calgary in August, the middle of the summer. On Friday, the clouds were ominous again, but we made it inside the mall without it raining. Once we were inside though, we heard a torrential downpour hammering the skylights. And when we left a little while later, I found hail on my car! A little hail is no big deal (especially since it wasn’t hailing anymore). So we headed home to rest for a bit. An hour later we headed out again to Calgary downtown for dinner. On our way, we saw a 10-car pileup that closed the road going the other way (we also saw 2 other accidents – a vicious three car collision spread out over both directions of the road, and a SUV that drove into an empty field and flipped itself) but as we got further downtown, it got even more weird. On the street, it looked like the middle of winter, with slush on the road and piles of snow in the median. 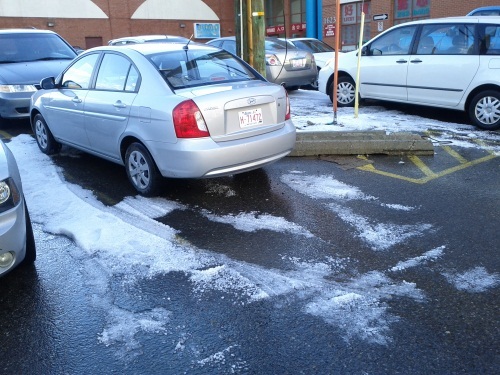 We parked at the restaurant, and the parking lot look like the middle of winter! Even after we were done dinner (so about 3 hours after the storm) the “snow” was still all over the ground and not melted yet! Apparently the area of downtown where we were in was hit very hard. There was news coverage (and some cooler pictures) in the major papers. 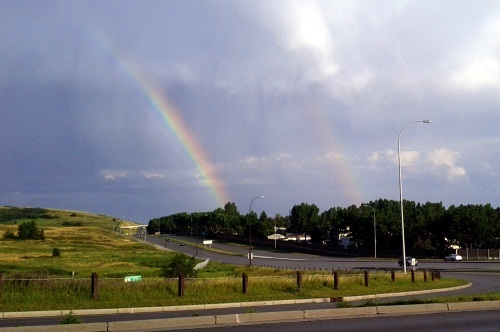 It wasn’t all bad though, we were able to see a double rainbow because of the crazy storm! Do you wait all winter for summer to roll around (which takes about 8 months to get here) so that you can go out and enjoy the nice weather? Me too. But one look at that weather forecast, with all of those 38°Cs popping out at me just makes me want to stay indoors to spend some quality time with the A/C and play video games all day. Kind of like winter I guess. Well at least I can look out the window and appreciate that we have sunny days! April showers bring May flowers goes the saying; but this April was a bit weird. It was still quite cold at the start of April – I was still wearing my winter coat for the first week! Eventually it started warming up (but still with temperatures of around 0°C in the morning and only 10°C in the afternoon) and started to rain. We received a month of rain in the last week! The trees are still bare, but our grass is getting greener due to the rain. I spent time and money on electronics this month, first by starting to upgrade my computer and then upgrading my phone to a Nexus S. I did a bit of work on Condado as well, although I have a lot of plans but not too much motivation to work on it. In news, the media spent the whole month talking about the upcoming Canadian election, and the Royal wedding between Prince William and Kate Middleton. My co-workers in the UK even get a day off because of the wedding! In February, our home project was to find a dining room table. We didn’t accomplish that although we did spend a lot of time visiting furniture stores and looking around. We just haven’t found one that we like and are ok with price wise. We also installed a programmable thermostat, which upon thinking, is probably BS when it comes to energy savings (maybe I’ll blog my rationale later). We did improve our energy savings by all 9 of our kitchen lights to LEDs (thank you Chinese manufacturing). February this year had a cold streak. The first half of the month was a stretch of sub -20°C temperatures in the morning. There was some snow too. Hopefully that will be it for Winter since Wiarton Willie was able to climb out of his hole, in -20°C weather, through 10cm of snow and not see his shadow. The biggest news event of this month was the mass protest in Egypt which finally resulted in President Mubarak resigning from his dictatorship. Then it was Libya and Iran’s turn, but that hasn’t been revolved yet. In other news, we have a new computer overload in Watson as IBM’s research project beat up on two dominant Jeopardy champions. In my spare time this month, I made a lot of progress on Condado, my San Juan clone, planned our spring break trip, and messed around with my Android tablet and Kindle. It was January of a new year, and I had no New Year’s resolutions to break, at least I didn’t break last year’s resolution to keep blogging updates each month. We started the month in LA, but came back to Toronto the day after. Work started the following Monday, and so did the cold weather; it’s been -10°C to -15°C every day, with some days hitting -30°C with windchill. We stayed in doors most of the time, I started and finished Fable 2 and Rock Band 2 on 360. Obama changed titles from being the president-elect to president, the inauguration was a big event for everybody; we even got to see it at work! The other big announcement at work was that we reported positive earnings for the fourth quarter and the year. This was quickly followed by rumors of layoffs and they actually followed through on the rumor to fire people.